Vytek manufactures several machines that are capable of excellent marking results, but today we’re going to focus on the MX Fiber Marking Series. Before we delve into the specifics of the line, though, let’s give a quick refresher of why an industrial marking system is a smart choice. Not all marking projects are straightforward and similar; plenty of them have their own unique demands. The great thing about marking with a laser, is the incredible amount of flexibility it affords the user. Multiple parameters can be adjusted on each laser marker in order to adjust the process to suit your needs and ensuring an unparalleled level of control, quality and speed. As for applications, laser marking is effective on plastic, blackened steel, aluminum, chrome, stainless steel and automotive filter caps. With the MX Marking Series, our goal was to create machines that combined the high quality you’d get from a Galvo system with the Gantry’s impressively wide range of uses. If your part size or automation is on the impractical side, MX is a wonderful alternative to the more rigid Galvo setup. The MX’s large working areas (12” x 24”, 24” x 36” and 24” x 51”) produce a high amount of productivity. And who wouldn’t want an extraordinary amount of efficiency from their equipment? Keep in mind that this is just one line of Vytek’s laser markers. If you feel something else would better suit your direct part marking needs, take a look at some of the other options Vytek offers you. The CO2Cab Cutting System Series is a fully-integrated, fully-enclosed 10.6nm CO2 Galvo System unlike any other system out there on the market today. The CO2Cab can function as both an industrial marking system and industrial cutting system for many organic and inorganic materials. 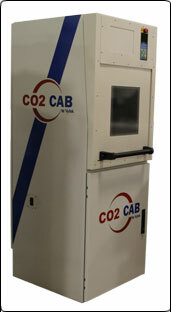 The CO2Cab Cutting System makes use of all metal-sealed CO2 laser sources made in the United States. It will be able to perform all of its operations hassle free for thousands of hours. The CO2Cab Cutting System is a fully enclosed Class I device that can be used with lasers ranging from 35 to 400 watts. For those of you just starting out, the CC Compact is the perfect starter system for any low production requiring laser marking or engraving. The CC Compact is lightweight, cost-effective and can be set up very easily by plugging the system into outlets as low as 110 VAC. Note: Be careful of which model you choose and what type of outlets you have and voltage requirements the model needs, if you order a higher power wattage, you will need a 220 VAC outlet. The CC Tower is a stand-alone system that can be fitted with a Rotary indexer for circumferential marking or a rotary dial table for higher throughput of direct part marking. For the heavy duty users, the CC Tower Plus is our largest standard CO2 laser marking and cutting system. This system has an over-sized enclosure, a plethora of available options, and the capabilities to accomplish just any about task you desire. 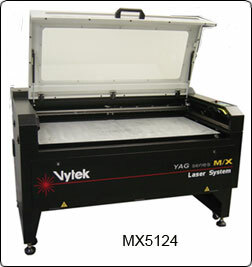 For more information on the products we offer, contact us or visit www.vy-tek.com.